Mission San Francisco Solano was founded in Sonoma July 4, 1823 by Father Jose Altimira and named for Saint Francis Solano, missionary to the Peruvian Indians. The mission was dedicated in 1824 and the original church was replaced in 1827 by a larger church. The mission was the last to be founded and the northernmost. Father Jose Altimira, the last of the Spanish Franciscans to operate in the California Missions Chain, set the location so far north to help push the Russians out of the area. Despite the fears, the Russians surprised the Spanish pioneers by donating a bell and other copper utensils. The site chosen by Father Altimira was sunny and far away from the cold and dampness of the Bay Area. The last founding Father hoped that these favorable conditions would have kept the Indian converts healthier. 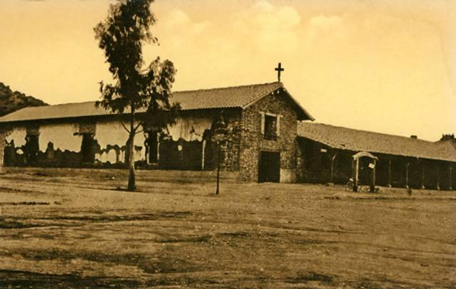 However, Mission San Francisco Solano served as a mission only for a short period of time. In 1834 the mission was secularized and razed in 1837. In 1840 the present chapel was built as the parish church for Sonoma. The mission was sold in 1881. In 1903 the Historical Landmark League purchased the mission and started a restoration project. When completed in 1913, the League turned the property over to the state. Further restoration was then done and the mission is now part of the Sonoma Mission State Historic Park.